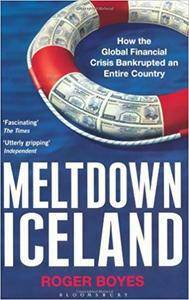 Roger Boyes, "Meltdown Iceland: How the Global Financial Crisis Bankupted an Entire Country"
The inside story of the bankrupting of Iceland It is a truism that when America sneezes, Europe catches a cold. The sub-prime mortgage crisis, which began in America in 2007, unleashed a veritable epidemic of financial ill health all over the world. All European countries were affected, and the developing world also felt a chill. However it was Iceland, a tiny volcanic outcrop in the North Atlantic whose population of 300,000 had the highest per capita GDP and counted itself the happiest in the world, which caught the worst cold. It has nearly killed them. 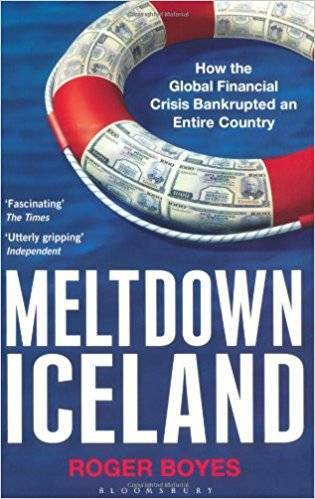 Written with panache and colour, and drawing on interviews with everyone from the prime minister, Sir Phillip Green, the governor of the central bank, Bjork and the local fisherman, Meltdown Iceland is an authoritative account of the financial destruction of this tiny, icy but vibrant country.